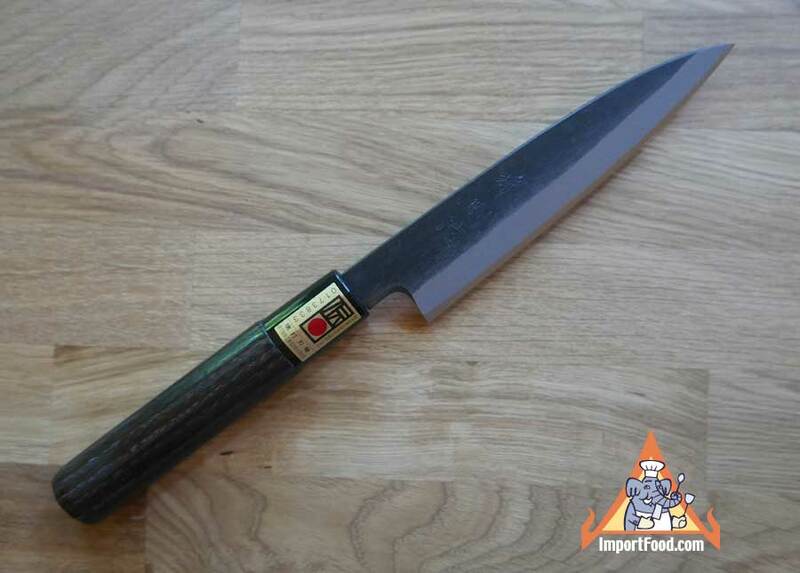 Hand Crafted Office Knife, Chestnut Handle, Sakai Japan, 10.5"
In Stock and Ships Immediately. This is known as an 'Office Knife' in Japan, used for cutting various fruits and vegetables. Highly useful knife that is sharpened on both sides. This knife blade is made entirely by hand at a master craftsman's shop in Sakai, the area best known for making the finest knives of Japan. The finish work and final sharpening is done in Sakai. The handle, chestnut wood imported from USA, is installed onto the blade by hand at the same shop in Sakai. The blade protrudes 6" out from handle. The handle is 4.5" long. Total length 10.5". The handle is round except for one slight ridge perfectly located on the upper right (as shown). This feels excellent in the hand and is popular with Japanese and western chefs. There is a strong black plastic band seal where the blade enters into the handle, as shown. The carbon steel (white steel / hardness grade 2 / made in Japan) is extremely hard and will keep it's sharp edge for months. The style is called 'black finishing' as you can see the steel is worked a special way to give it a natural black look, above the blade. The black area is less likely to rust and maintains the look for the life of the knife. Each knife comes in a strong decorative cardboard box custom fit for shipping. Our handmade Japanese knives are all individual works of art - starting at the hot forge where various elements are blended together to form extremely strong steel that holds a sharp edge for months of constant use. Japanese steel has been hand crafted into prized knives for hundreds of years; a dedication to perfection you don't find anwhere else. It all starts at the forge, where elements are blended then pounded together. Next the steel is laboriously pounded into shape, goes through a long process of sharpening, the knife is carefully heated again just right so the handle can be tightly pounded on to create a seal that endures as long as possible. Hand crafted by master knife makers and sold to you at a very reasonable price, as we purchased directly from the maker. Similar knives are sold in Tokyo shops and abroad for much higher prices. You are getting a great deal with us on a real work of art. Each unique knife is totally made by hand. Order now and we will have them available in a few weeks.